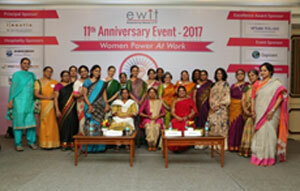 eWIT 11th anniversary celebration in Crowe Plaza on 28th April 2017 from 3pm to 8pm proved to be an interesting bouquet of events which showcased the power of Women in both IT and non-IT world. The first session by Ms. Uma Sridharan, Consultant, Learning and Development covered important aspects of Personal Branding and what is critical for aspirants to set right perception in the work environment. This was well received by audience especially young members who were starting their career in IT. 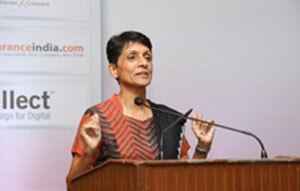 Ms. Sridevi Raghavan, CEO, Amelio Child Care Pvt. Ltd. who started her own day care venture Amelio, gave her view as an entrepreneur and the importance of getting things done. Ms. Dhakshayini Venkatesh, Advocate, Madras High Court shared her experiences, challenges and success factor which defines the male dominated legal world. Mr. Vijay Rangaraju, Vice President-HR, Intellect Design Arena Ltd. talked about his experience from HR angle and how organizations can offer different cultural fragrances which employee is looking for. After a brief Q&A session, the much awaited 'fireside chat with scientists' was announced. The scientists Ms. MV Roopa and Ms. Ceena Sunil from ISRO and Dr. Vidya from IGCAR shared their interesting professional and personal experiences, their individual WOW moments during rocket launch, their aspirations, challenges and learning’s. They received standing ovation when they recounted their achievements in the world of rocket science. 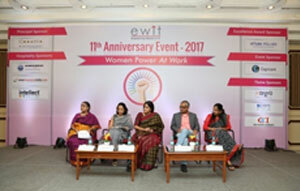 After the key note address, eWIT 11th Anniversary souvenir was released by Ms. Letika Saran and received by one of the panellists Mr. Vijay. The winners of the excellence awards (for Quality, HR, Technology) were given away cash prizes and certificates. 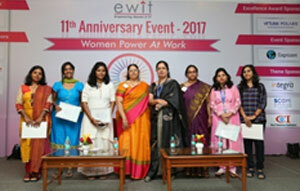 This was part of a long selection process by eWIT to identify and award the young and bright talent from the industry. eWit Annual celebration closed with a sumptuous dinner which gave opportunities for participants to network and meet new colleagues.